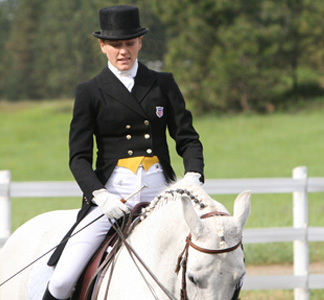 Melynnda Thiessen began her career endurance riding at age 9. 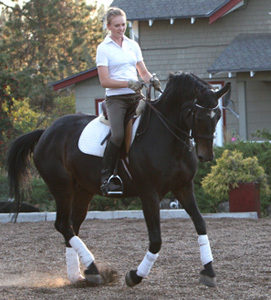 Moved on to Pony Club as a high school student where she discovered Dressage. After college, she began extensive training under the instruction of Dale Forbes. Currently, a USEF/USDF Bronze & Silver Medal rider, she trains and shows FEI with her mustang Mariah and TB/Hanovarian Westley along with the horses in training. With an extensive physical training background and the assistence of her Pilates & Yoga coach, her focus is incorporating rider body awareness in her teaching. 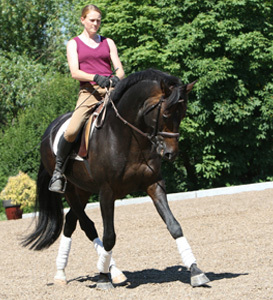 This is accomplished through body work exercises of strengthening and stretching and applying the "mind to body" technique on the horse. 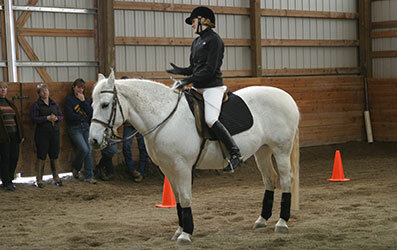 Clinics are available for riders wanting body work. Please visit Dale's training page here. SD accepts horses in training as space allows. We are a small production with a few horses as a time. Thus, each horse is assured 5-6 days a week of quality training time and attention. Private lessons and group lesson are available on and off our premises. We work with all types of riders including Pony Clubbers, pleasure riders, dressage enthusiasts and more.We do not provide lesson horses at this time. Performing a demonstration at Mica Meadows in Coeur d'Alene, ID.